How I Met Your Mother: "Bass Player Wanted"
Spoilers below, so you might want to actually watch the episode before venturing further. Or not, it's entirely your choice. You could make worse choices, of course, including something that gets you arrested. They'll be slapping the handcuffs on your, and you'll think to yourself, "This is far worse than being spoiled on an episode of How I Met Your Mother." It's all about perspective. This Open Letter to People who say "Happy Holidays"
Dear People who say "Happy Holidays,"
There are three phrases that history will never forget and never forgive: "Crucify Him," "I was just following orders," and "Happy Holidays." I just want to put what you're doing in the proper perspective, because right now you seem blithely unaware of your crimes against humanity. When you wish me a "Happy Holidays," are you completely unaware the depth of your depravity? Don't you understand that every time you utter those foul, disgusting words, your soul shrivels up and Lucifer dances a jig? Can't you see the Divine Judgement headed your way? I'm telling you this, as a friend, that you need to stop this reprehensible behavior immediately. One of these days, it will be legal to hunt people like you for sport. After all, running you down like an animal is the only solution I see to preserving the true meaning of Christmas. Your bloody carcass will serve as a clear reminder that Christmas is about God's love for all humankind. Except for people like you. 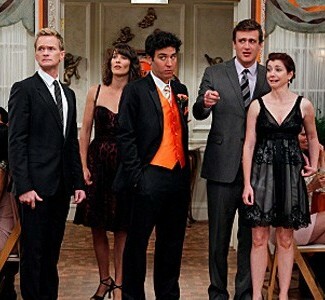 How I Met Your Mother: "The Rehearsal Dinner"
Spoilers ahead, so be very cautious before you proceed. I know, you see "spoiler alert" and you just have to charge ahead. You must be one of those people who can't help but push that button. That big, red, flashing, shiny button. It's human nature, really. In fact, maybe it wasn't an apple in the Garden of Eden, it was a button. Adam and Eve were told not to push the button. They could do anything else but push that button. Of course, eventually, they did push the button and got kicked out of the garden. What, you wanted a spoiler alert for that? Dude, there's a statute of limitations for spoiler alerts. I have a cap gun sitting on my desk, and it's all I can do not to grab it, pull the trigger, and let loose. I'm a grown man, with all sorts of adult responsibilities like paying bills and mailing things with stamps. Every day there are people who look at me as if I'm some kind of authority figure, and then it dawns on me that yes, I am some kind of authority figure. I am often referred to as "Mister," once more cementing my role as responsible adult in this society. And all I want to do is pull the trigger on that cap gun until the room smells like whatever a room smells like after you go through an entire round of caps in one go. I almost wish I had a cat so I could scare it and post the video to the internet, because the internet never gets tired of cat videos. My wife would either give me a cross look for having terrified the cat, or be angry that I wasted all the caps because she wanted a turn.